On tonight’s GAME OF THRONES the show was another great one and there was one horrific scene, I won’t spoil it for you, you have to read our recap to find out what happened. As we race toward the finale, I cannot wait till next week’s penultimate episode. The next episode is called, “The Watchers on the Wall” and we have managed to get our hands on some juicy spoilers and a sneak peek video of next week’s episode. On tonight’s show Mole’s Town received unexpected visitors, the Wildings. The wildings raided the town and killed everyone they encountered. Littlefinger’s motives were questioned by the heads of the Vale. Sansa came to Littlefinger’s rescue. Ramsay Snow proved himself to his father and was rewarded by Roose (his father) giving Ramsay his name. Tyrion’s fate was decided. Tyrion and Jamie had some brother time together. Oberyn Martell “The Red Viper” got his chance to avenge his sister’s death as he acted as Tyrion’s second. Sadly his arrogance him killed in a horrific manner by Gregor Clegane. More happened! If you missed the episode you can read our full and detailed recap, right here for you. 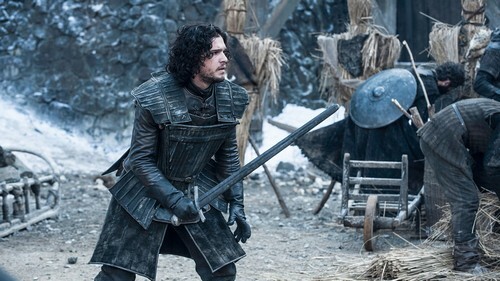 HBO’s Official Synopsis: “Jon Snow (Kit Harington) and the rest of the Night’s Watch face the biggest challenge and most dangerous threat to the Wall yet.” Written by David Benioff & D. B. Weiss; directed by Neil Marshall. On the next episode we see Ygritte and Jon Snow and hear someone saying, “Love is the Death with Duty.” The episode will be about the “Battle of Castle Black” between the Wildings and the Night’s Watch. Mance sends an advance team to try and defeat the Night Watch. Jon organize the defense around archers in the towers and a line of fighting men. The advance team is not successful and Mance realizes he must attack the Wall. The Game Of Thrones Season 4, Episode 9 “The Watchers on the Wall” airs on HBO on June 8th, 2014. Check out the preview videos from episode 9 below and let us know in the comments below what you think!